Sleep easy – there's new hope for patients suffering from sleep apnea. Ohio State Wexner Medical Center is the only health center in central Ohio offering upper airway stimulation, a new surgical treatment option for patients with obstructive sleep apnea. This is an option that works inside your body, with your natural breathing process. It goes where you go, is easy to use and operates silently. It’s ideal for patients who have not responded to or cannot tolerate other sleep apnea treatments, such as CPAP. With obstructive sleep apnea, the tongue or other soft tissue may block the airway, creating dangerous breathing problems during sleep. Upper airway stimulation uses an FDA-approved implantable device similar to a pacemaker to deliver mild stimulation to the hypoglossal nerve to prevent the tongue from blocking the airway. The device is not activated for the first month to allow for full recovery. Patients may experience mild discomfort the first few days and some scarring, but most report little pain. After one month, the patient returns to their Ohio State Sleep Medicine physician to have the device activated and to set initial stimulation parameters. The patient is then able to turn the device on and off based on their sleep schedule, using a handheld remote. The device can be set to start at a set interval after going to bed (typically 30 minutes), allowing adequate time for the patient to fall asleep naturally. Throughout the night, the device continually monitors the patient’s unique breathing patterns, issuing stimulation only when the patient inhales (which is when sleep apnea events occur). Upon rising, the patient simply turns off the device using the remote. Some patients report mild twitching of the tongue during use, but this can be minimized by adjusting the stimulation settings. A follow-up sleep study helps each patient maximize the device effectiveness and appropriate stimulation levels. The device battery lasts about 11 years and can be replaced when necessary. Patients must be over age 22 with a confirmed diagnosis of moderate to severe obstructive sleep apnea. Symptoms of obstructive sleep apnea include snoring, daytime sleepiness, irritability and difficulty concentrating. Left untreated, it can also lead to other health conditions such as high blood pressure, heart disease or stroke. If you suspect but do not have a confirmed sleep apnea diagnosis, we will help you schedule the required sleep studies when you make your initial appointment. The upper airway stimulation device might also be appropriate for those who have both obstructive and central sleep apnea, as long as the central sleep apnea episodes account for less than 25 percent of all disrupted breathing episodes. Individuals should have a BMI of 32 or less, although we will work with patients on an individual case basis. Ohio State Wexner Medical Center's Ear, Nose and Throat physicians specialize in surgical and non-surgical treatments for sleep apnea. We evaluate each patient’s condition and recommend the best treatment option for you. As an academic medical center, we research and offer new treatments to our patients sooner than other hospitals.The Department of Otolaryngology - Head and Neck Surgery is the highest nationally ranked department at the Ohio State Wexner Medical Center. U.S. News & World Report named us sixth in the nation. Patients in central Ohio interested in upper airway stimulation will find it only at Ohio State. Schedule an appointment for a consultation with Dr. Eugene Chio by calling 614-366-ENTS (3687). All potential candidates for upper airway stimulation will need to have a physical examination and a sleep endoscopy. An overnight sleep study is also required, although results from prior sleep studies may be used. We will coordinate and help you schedule the test prior to your appointment with Dr. Chio if needed. A: Upper airway stimulation works like a pacemaker treatment for sleep apnea. The surgically implanted device, which consists of three small implanted parts, stimulates key muscles at the base of the tongue to maintain an open airway. You may feel a mild contraction or tingling sensation when your tongue muscles are stimulated. Through a handheld remote control, you turn on/off the device before going to/awaking from sleep. Q: What are the results like? A: Clinical trials with the device show that most patients sleep better, snore less and experience improved overall quality of life. A: An FDA-approved treatment, the upper airway stimulation procedure is reviewed by insurance companies on a patient by patient basis. You can discuss coverage with your doctor at your consultation appointment. Many require patients to try other more-traditional treatment options first. Q: What is involved in the surgical procedure? A: The implant procedure is done under general anesthesia. The small generator is surgically inserted into the chest, which is connected with a breathing sensor and stimulation lead in the neck. There will be some swelling at the incision sites for a few days after surgery. You should be able to return to normal non-strenuous activities after surgery. Q: What monitoring and maintenance of the device is needed after surgery? A: Following your procedure, your doctor will work with you to monitor the effects of the implant device to ensure you are getting the maximum benefits. Q: Is upper airway stimulation considered a first-line treatment for obstructive sleep apnea? A: Patients with diagnosed sleep apnea must first demonstrate an attempt to use a CPAP machine, as it is considered first-line therapy. However, if you quickly discover you cannot tolerate the machine, perhaps considering it too restrictive, claustrophobic or noisy, or it is not effective in reducing your sleep apnea episodes, you can then be considered a candidate for upper airway stimulation. A: There have not been reports of early device, wiring or electrode failure. Batteries do need to be replaced approximately every 11 years through a simple outpatient procedure. 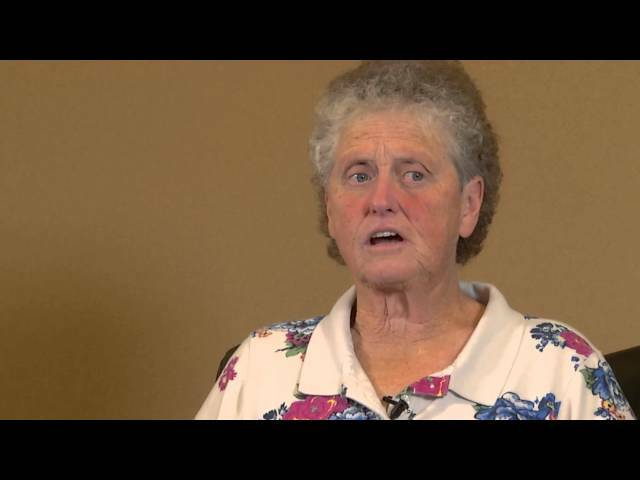 Freda struggled with a CPAP for 22 years before finding relief for her obstructive sleep apnea with upper airway stimulation. If you are breathing normally and do not have sleep apnea, your airway remains open while you are sleeping. For patients with sleep apnea, your airway is obstructed at the soft palate, tongue base or in both locations. This results in lower oxygen levels in the blood, which arouses your brain and body to open the airway. Consequently, your sleep cycle is disrupted many times during the night. Similar to a pacemaker, the upper airway stimulator is surgically implanted to deliver mild stimulation to key airway muscles to prevent blocked airways during sleep. The device consists of three implanted components including a small generator, breathing sensor lead and stimulation lead, all controlled with the small handheld sleep remote. 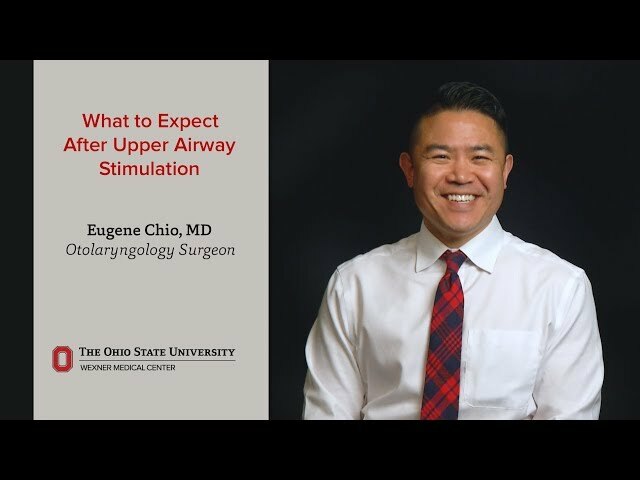 Eugene Chio, MD, explains upper airway stimulation. He explains how the implanted device works and that The Ohio State University Wexner Medical Center is the only medical center in central Ohio currently offering the procedure.